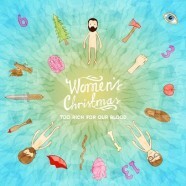 Mere babies on the Irish music scene, Women’s Christmas impress with debut album Too Rich for Our Blood, a riotous blast of indie guitar noise. Formed in 2013, and comprising of members of Villagers, Jogging and No Monster Club, you could be forgiven for thinking that this is some throwaway side project but on the evidence of this thrillingly fresh debut, this is very much a band in their own right. A song like ‘Chalklines’ is typical of the kind of fare to be expected on this twelve track debut; there are passing nods to the Wedding Present, Wolf Parade and the Replacements but it’s all bundled up in one exuberantly cacophonous package. Women’s Christmas offer further compelling proof that right now, the Irish music scene is as richly diverse and exciting as it has ever been. Well worth your full attention.